Mailing postcards in Puerto Vallarta is not difficult but there are a few things you should know. If you’d like to mail a few postcards or letters home, you can purchase postage at a local post office and then either mail the items right there at the post office, or later on during your trip fill out your postcards and/or letters and then mail them at one of several mailboxes located throughout the city of Puerto Vallarta. The government of Mexico’s postal service is Correos de Mexico, and their post office buildings are pink and white. We’ve noticed, however, that the exact shade of pink that they use for painting their official post office buildings is not always consistent and uniform; on some buildings the pink has a definite tinge of purple. They have an easily recognizable mail and post office symbol: a white dove carrying mail (a green envelope) in it’s beak with a pink background. Below is the post office in Marina Vallarta located just south of the PVR airport on Calle Albatros which is the street that runs along the north side of the Plaza Marina Shopping Center. While looking for the Marina Vallarta post office on Calle Albatros, the nearest cross street is Gaviotas. Mailing postcards from this location is easy! Mailing Postcards in Puerto Vallarta. This is the Post Office in Marina Vallarta. 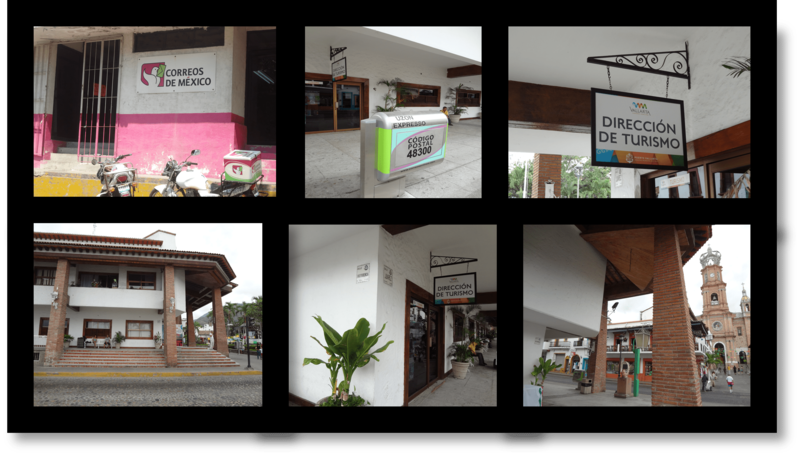 The photos below show how to find the Marina Vallarta mailbox that is located right on the corner of the street outside of Marisma’s Fish Taco Restaurant. It is behind the Neptune Plaza shopping center, and just a half block south of the whale statue at the entrance to Marina Vallarta. Mailing postcards: This mailbox in Marina Vallarta is easy to find. If you’re staying at a resort in this area you can mail your letters here! 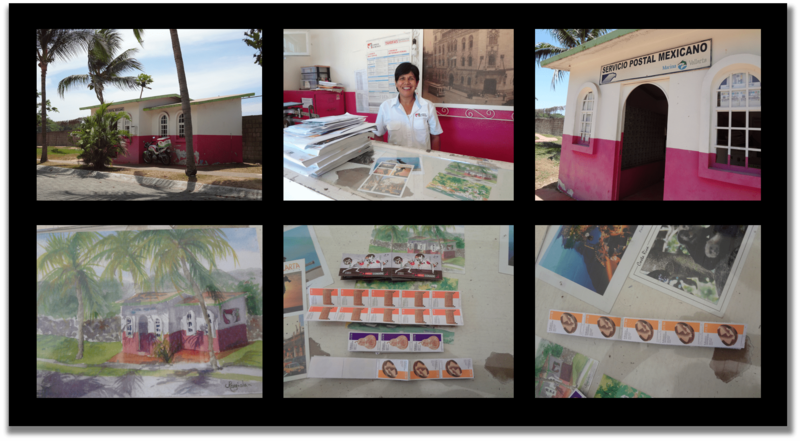 The photos below show the Puerto Vallarta post office located on Columbia between Argentina and Venezuela. This is a location where you can purchase postage stamps. For tourists, the other photos below show one of the easiest mailboxes to find in El Centro. This mailbox is located right outside the Puerto Vallarta Tourism Office (Direccion de Turismo) which is on the exterior ground floor of the old City Hall building (south-east corner of the building). The old City Hall building is directly across the street from the Malecon, right across the street from the Main Square (north of the Main Square), and just down the street from the famous church with the crown, Our Lady of Guadalupe Church. Mailing postcards in Puerto Vallarta: There is an easy to find mailbox just outside the PV tourism office across from the main square and just down from the iconic church with a crown (Our Lady of Guadalupe Church). While you’re mailing off your postcards in El Centro, it’s highly recommended that you stop in at the Tourism Office to pick up a variety of city maps for Puerto Vallarta as well as various flyers for upcoming events, tour companies, restaurants, etc. The photos above show one of the easiest mailboxes for tourists to find in the Romantic Zone (AKA: The South Side / Colonia Emiliano Zapata). This mailbox is located on Basilio Badillo in front of Grill’O Tacos and Beer, and just west of and across the street from these well-known restaurants: The Pancake House and Nacho Daddy’s. Vacationers in Nuevo Vallarta and Bucerias can purchase postage stamps and mail off postcards and letters at the post office in Bucerias which is located directly off of Carr. Vallarta-Tepic (the main highway) and Bucerias Centro. The address is: Heroes Nacozari #8, Bucerias, Nayarit, Mexico. At the signal lights to enter Bucerias Centro from the main highway, you can see the pink and white post office. It’s on the left-hand-side of the street, and about three doors down from a locksmith’s store on the corner. We investigated this matter thoroughly, and within the sprawling nearby neighborhood of Nuevo Vallarta / Flamingos, there is no post office and absolutely no mailboxes. Besides carriers such as UPS, FedEx, DHL, etc., the above post office is the only place within Bucerias to purchase postage and mail letters. When you mail off postcards and letters at a post office in Puerto Vallarta or Bucerias, Mexico, it really is a snail-mail situation. It takes a very long time for items to get from Point A to Point B. You may very well be back home from vacation when your postcards finally arrive to your family and friends. So it is strongly advised that you purchase a “certificado internacional” which is a tracking code allowing the mailer to track the item online.